This week I am hosting Menu Plan Monday and am thrilled to do so. I have chosen squash as the ingredient of the week. 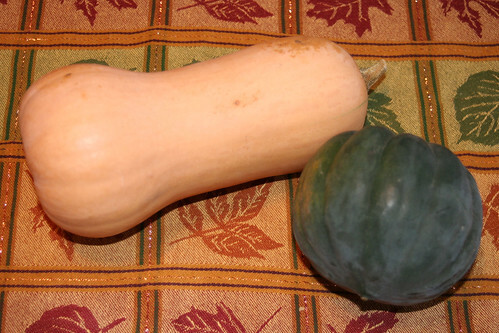 Squash (aside from yellow, zucchini squash) is relatively new in my menu plan. I had just never really tried it before. Last fall I made some salmon and decided to makes some butternut squash along with it and I was quickly in love. I have now branched out to Spaghetti Squash, one of my new favs. We have a very busy week this week. Last night I had planned on making homemade pizza, but was unable to do so, so we went out instead. I am planning on moving that now until Friday. Make sure to check out Org Junkie for more fun menu ideas. Ginger from Fresh Ginger has a yummy menu planned. I may just move in with her for the week. 😉 The Turkey tenderloins stuffed with spinach have caught me eye. I love spinach! Brenda at Book of Yum has an amazing looking menu this week. The pumpkin & black bean casserole has me drooling, as do some of her breakfast choices. Kimberly at Living Free hasn’t been feeling well. I hope you feel better soon!! She is planning on cooking a pumpkin this week and using it for something. I can’t wait to see what she does with it. Looks like a fantastic Menu gal!! I am finally back into my menu planning swing… boy am i lost without a menu plan!! 😉 I can’t wait to see how you make your acorn squash! I need to try that!! oh here is my menu! I forgot to add my link! Thanks Carrie! 🙂 I’ll make sure to share the recipe once I make sure it is good! LOL! Thanks for hosting! Snickerdoodles sound like a great idea for this week. Kim – I tracked you down, and here is my menu for the week! Still nothing too creative because I’m working too many hours and not planning ahead well enough, but at least we are eating. Glad you found me, Karen! 🙂 Your menu looks great! Great post. Thank you for hosting this week.